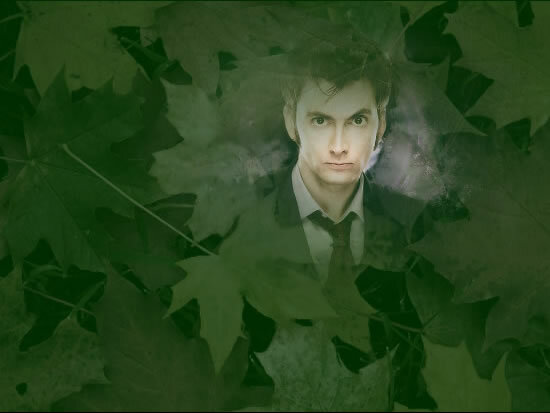 “Forêt,” The Doctor told her. By her side Ric started to whirr into action to tell her that it was Earth French for ‘forest’. But she knew French and she got there first. “And you have a girlfriend here.” The Doctor was standing behind her, but she could see his reflection in the viewscreen, over the beautiful planet. He was smiling despite all efforts to look cool and collected. “Cupids arrow in both hearts,” he said with a laugh. He got it right. The TARDIS materialised on the rain-soaked platform right outside the workshop. He was ready to run out of the door as soon as they landed. Susan followed behind, Ric hovering at her ankles making a mechanical noise that sounded a bit like a whimper. A moment later he forgot all about Ric as a tall, dark haired boy with brown eyes ran out of the workshop door just before a red-headed, green-eyed woman. The Doctor seemed surprised by the way the boy hugged him so affectionately. “It is good to see you, mon père,” the boy said. It was a few moments before The Doctor realised what he had said. “I understand the reason,” he answered. “Mother wants you to herself. I can feel her impatience.” The boy grinned and turned. As his mother and father embraced and kissed lovingly he stood back. “Then you are welcome in our home,” he told her. Dominique, when she finally took her lips away from The Doctor’s, confirmed that. She told Dominic to go and store his paints and lock off the spinning wheel. There would be no more work this afternoon. Then they climbed the ladder that brought them to the living quarters. In the fine weather that was still several weeks away, this room was hardly used. The platform outside was their place of resting and eating and amusement. But in the bitterly cold time just gone and the dark, rainy season they were in now, this room with cushions covered over with furs and rugs and the stove where food was cooked, was cosy. Two other people joined them in their leisure. Dominic introduced the young girl as Thérèse and The Doctor noticed a look in his eye when she sat beside him and realised Dominic had grown up a LOT since he saw him last. The other was a young man of twenty whom he remembered as Jareth’s younger brother – Dominique’s brother-in-law through her marriage to that good man who had cared for her in the years he was absent. His warmest smile, The Doctor noted, was for Susan. He reached out his hand to her. “It is short for Jean-Michelle,” he told her. “That’s a nice name,” she answered. He smiled and called her Suzette again. She decided she rather liked to be called Suzette. Thérèse and Miche were both, it transpired, apprentices in the spinning, weaving and hand painting arts that Dominique and her son both excelled at and were pleased to have the afternoon off to spend time with their guests. Dominique prepared a meal for them. Before Miche claimed her attention again Susan looked around and took in the fact that she was in a house built onto the side of a tree. A rope ladder hung down in one corner leading up to another level - Dominique’s bed room, and above that, Dominic’s room - all self-contained against the weather. The Doctor and his son were carrying on two conversations at once. One out loud among his friends, and a telepathic one, in which they said many of the things that had, of necessity, been left unsaid. “I know you love my mother. That is enough.” Dominic smiled warmly at his father before saying something to Thérèse at his side. “She’s special to you?” The Doctor asked and he felt the telepathic equivalent of a blush wash over him. They ate a pleasant lunch and The Doctor helped Dominique to clean the dishes afterwards while Dominic, who would have done that chore otherwise, was free to introduce Susan to a game a little like chess, but less formalised, using a board and pieces hand carved, he said, by his other-father, Jareth, some time before he died. He spoke of Jareth with affection, even though he had taken to using that phrase ‘other-father’ for the man he had once thought to be his biological parent. Susan took to the game quickly enough and after beating Dominic, played a hard fought game against Miche, who, she was sure, eventually LET her win. Then they sat with The Doctor and Dominique and watched Dominic and Thérèse play the game - called Sauter because the pieces ‘jumped’ over each other to gain advantage. A gentle afternoon thus passed and Dominique made another meal for them all. While they ate, the rain stopped. Dominic got up and opened the shutter and between dripping branches, starting to bud, there were weak rays of sunlight. “The warm sun days will soon be upon us,” he said. Susan looked at The Doctor before she accepted his offer. Dominic and Thérèse stood, too, reaching out to hold hands with each other. They offered to join them in a walk. “Mother wants to be alone with you,” the boy told The Doctor telepathically. The Doctor grinned at him. He KNEW that without any telepathy needed. As the four youngsters left the room he lay back on the cushions and turned his smile on Dominique, who came to his side at once. She didn’t need to go on. The Doctor understood. He berated himself for not expecting the question. Before when he visited, he was either alone, or in mixed company. Susan alone with him, was bound to make her wonder. Dominique WAS, indeed, barely twenty years old when he first looked into her flashing emerald eyes and found himself smitten, and that was many years ago, now. Dominique laughed, as he hoped she would. He understood her fears. But he knew his answer to them. He put his hands either side of her still flawless face. She was forty now, though the good, healthy living meant that she didn’t look it yet. She looked the same age as he did, both of them giving the lie to the world. But while he would stay looking thirty-five for a long time, she would not. The years would catch up with her soon enough. Ten years would make her fifty, then sixty, seventy… He wondered what the lifespan was for people on Forêt. Barring accidents, their lifestyle was good. She could live to a hundred. But her face would line. The red hair would turn grey. Her bones would become brittle. Perhaps even those lively green eyes would be afflicted by old age. But he would never stop loving her. He would not let his head be turned by any young face as long as she was alive. “I believe you,” she whispered. He was surprised. The respite from the rain continued into the evening. When others of Dominique’s friends finished their daily chores, they all came to the platform outside her living quarters and a fire was lit in the brazier there. A party celebrated the visit of The Doctor and his friend who was new to Forêt. Susan was overwhelmed by the hospitality the people gave to her as a stranger. The Doctor noticed that Miche kept close by her no matter who else talked to her. He still called her Suzette, and she answered to it. What may come of that, he wasn’t sure. But nothing that could harm her, he was almost sure. “Come,” Dominique said. “They do not need us.” She took The Doctor by the hand and they climbed up to the high walkway where it was quiet. They looked down at their friends and listened to a song somebody had begun. It was a ballad that told the story of the Forêtean victory over the Robos, and the stranger who made it possible, The Doctor. They climbed higher, away from the music, away from the camp fire, to cool night air, the stars above them and a dizzying drop below. “I used to hate heights,” The Doctor said. “Until I came here.” Then he said nothing at all, and they didn’t walk anywhere for a long while as they kissed lovingly. He laughed as he remembered. He had barely stepped out onto the planet when she had grabbed him by both hands and plucked him up into the trees. He had swung in the air by her arms on the end of a bungee rope, and in that moment he had put his trust in her. He trusted her not to drop him. Later that same DAY he had trusted her to love him completely. Yes, until then, he had been a loyal son of Gallifrey and even if he bent the Laws of Time out of shape in the name of right and justice, he had been serious about the tradition and the law that dictated how a man and woman conducted themselves. But that night he had let her take him by the hand into her bedroom, and he had forgotten he was a Time Lord, forgotten about rules, about tradition, and remembered only one thing. The last time he loved a woman he had not even dared to tell her he loved her and when he tried, it was too late to do so. So when Dominique came into his life, he had grabbed with both hands. He had not let anything get in the way. But he felt guilty about it. He had been a real husband to her for such a short time. He had treated her as if she was just a port in a storm, a warm place to lay his head when he was weary. She was always ready for him. She accepted that role in his life without complaint. She called him her husband. But most people would simply call her his mistress. His bit on the side. For a moment she didn’t answer him and he wondered if he had said the WRONG thing. His smile matched hers, caught in the firelight from below. They stayed in their own quiet place until the party below quietened and everyone returned to their own places of rest. When they came down to the platform Dominic and Susan were tidying up. But they forgot about the chores when they heard the news. “Thank you,” The Doctor said. In a strange kind of way, having her say that, it almost felt as if his own Susan, his grandchild from the first time he risked his hearts on love and took to the domestic life, had given her blessing to him. It was silly to think that way, but Susan had filled that role for him, his surrogate child. And he WAS glad she approved. “Jean-Michelle will be pleased enough, I think,” The Doctor said with a smile. “He seems a nice boy,” she said. Then Dominique claimed The Doctor’s arms again, and her son brought them a cup of mildly alcoholic fruit juice. They shared the cup while he and Susan had a cup each. The betrothal was sealed thus before everyone said goodnight. Susan went to settle for the night in the living room. Dominic quickly disappeared up to his own room. The Doctor and Dominique took their leisurely time going up to the place where they slept. Where THEY slept, The Doctor thought as they undressed and slid into the warm bed. He had been born in a mansion, raised in Ambassadorial residences. As a youth he had at various times felt at home in a Shaolin Monastery and a boarding house in Victorian London. Later he spent time in Milan where he roomed with a young man called Puccini who loved wine, women and music in any order they came to him. Later still, for a short time, his home was officially a junk yard in East London, about as far from the mansion of his birth as it was possible to get. For more than half of his life the TARDIS was the only place he COULD call home. Now he was ready to make a tree in a forest his mailing address. It was a big thing. His hearts fluttered alarmingly as he lay there in the arms of the woman he had pledged his life to. He knew the wanderlust would never die. He ALWAYS wanted to be out there among the stars. He loved reaching new places in the TARDIS. He loved having somebody like Susan to teach the mysteries of the universe. But now, until the end of her life, he would have Dominique as his wife. He would have a life here, that he could, and would, return to as a respite from the wandering life. The next day, the preparations for the wedding enveloped the whole village. Dominique was, after all, officially the leader of the village. That she was getting married was a big event, even though everyone knew she had called the man she was marrying husband for many years before. The Hall of Devotions had devoted attention to it by the carpenters and the painters of the village, and a feast was prepared and music practiced. The Doctor was true to his word and while Thérèse, Miche and Dominic span the thread his hands blurred on the loom as he wove yards of silk. Susan and Dominique sewed it into a wedding dress. “One tradition from my world,” The Doctor said, emerging from the TARDIS after they had broken the work to eat their midday meal. “The bride’s worth is measured by the jewels sewn into her dress.” He dropped a canvas sack the size of a sugar bag onto the pile of half finished silk. “There must be a million pounds worth there,” Susan told him as she ran her hands through the cool, glittering diamonds. “Then that’s what she’s worth,” The Doctor replied. On Forêt, there was no such thing as money, and jewels had no worth at all. They were just pretty things. But on planets where they DID have a value, Susan’s estimate could be squared and squared again and then multiplied by ten. Yes, the diamonds had a value that could be measured. But Dominique was priceless to him. The night before the wedding he didn’t sleep beside her. He could at least keep some of the traditions of his own race. After a pleasant evening with their friends, he kissed her fondly and climbed to the high observation platform where they had observed the comet that nearly destroyed the planet. He had a piece of chalk with him and drew on the boards a neat Seal of Rassilon, a pattern he learnt to draw from memory as a child not long after he mastered squares, triangles and hexagons. Then he knelt in the middle of it and looked up at the stars in a clear, cloudless spring sky. He looked down and let his mind drift over the sleepy but content minds of all the people in this village he loved. Then he cleared all his thoughts and put himself into a third level meditative trance as part of the purification ritual before he was married to the woman he loved. It got cold during the night, but it didn’t bother him. He had often meditated in the open air in that way. When he roused himself he felt wonderful. He slipped down the ladder and into the TARDIS. In the wardrobe he found a suitable outfit for the wedding. The full Prydonian regalia was a little too much, but he found a simple black robe with a silver Rassilon seal on the front and a cloak that fastened with a clasp moulded on his own family seal. He looked at himself in the mirror and smiled happily. “No cloister bells,” he whispered. “No mauve alerts. No trouble. Let me have this day to myself. I’ll fight the universe’s battles again afterwards.” He went back through the TARDIS to the console room. “Wish me luck, Ric,” he said. “Good luck, Master-Doctor,” Ric answered. As he stepped out of the TARDIS Dominic and Miche met him. They were his attendants at the Hall of Devotions while Susan and Thérèse were Dominique’s handmaidens. “Yes,” The Doctor noted. “Just as it is on Gallifrey.” He walked with them across the walkway to the Hall of Devotions, which had been beautifully decorated with spring flowers. Almost everyone in the village was there already as he stepped up to the altar where the Minister of Devotions waited patiently. Dominic gave a gasp of surprise as the door opened once again and the handmaidens stepped inside before the bride herself. The Doctor held his breath as he watched her approach him. She didn’t look like the mother of a fifteen year old boy now. The years seemed to have dropped away and she was the lovely young woman who first took his breath away. The silk dress glittered and shone with diamonds, and she smiled joyfully as she walked towards where her groom stood. “She looks so beautiful,” Dominic whispered. “That she does,” The Doctor answered as he reached out and took her hand in his. He turned with her to the Minister of Devotions who began the simple but beautiful ceremony, a full eleven hours shorter than it would have been on his own planet, but in its way fully binding on them both until death. He fully meant to be her husband until then, even if he couldn’t be with her all the time. There was one moment when it almost seemed like the ceremony couldn’t continue. He realised that nobody on this planet knew his real name. The Minister looked at him with a puzzled expression. He looked at Dominique. She took his hand and said his name that he had whispered to her once as he lay in her arms. Then she made her vows of love and devotion to him. He made the same vows to her and slid a ring onto her finger - a ring forged by the metalsmith of the village but with Gallifreyan gold from the same vault in the TARDIS that the diamonds came from. She put a second ring on his own finger. The Minister said a few more words and they were married. The villagers celebrated in style. The wedding of their village leader was an excuse for setting aside work and enjoying themselves. A great deal of fermented fruit juice was drunk and there was music and dancing and general joyfulness. The party would go on into the night, but as the lamps were lit in the evening The Doctor took his bride by the hand and they headed for the TARDIS. Susan stood with Dominic, Thérèse and Miche. “I know you will, mon pére,” he answered. They hugged lovingly. Then The Doctor looked at Susan. “Miche wants to teach me to spin silk,” she countered. “Miche wants to teach you a lot of things,” The Doctor noted. He paused and looked at her. Surrogate parent was, for that moment, a very real role. On behalf of her parents he needed to give her the right advice now. He laughed. She gave him a kiss on the cheek and then stood back. It was strange seeing the TARDIS disappear without her. She did feel a little uncertain. She wasn’t even sure how far away from Earth she was. “But first… there is dancing.” She smiled as he took her in his arms for a slow, romantic dance. The music was a long way from the kind of thing she used to listen to, but she was also a long way from Earth, and that hardly bothered her. Romance had never really been something that interested her before. She didn’t reject it. She just felt there was plenty of time for it. But now, in the last place she ever dreamt of finding it, she looked into the eyes of a handsome man as he danced with her in the firelight and she knew anything was possible. As the days went by she found herself enjoying living life as a Forêtean. She and Miche, Dominic and Thérèse worked happily together by day and spent their evenings in quiet entertainments. Both of the young men enjoyed hearing Susan tell them about her life with The Doctor, and when she ran out of adventures she talked often about Earth. They both found it fascinating, though it was Miche, more than Dominic, who asked her about it. “The Doctor says so,” Susan told him. And that seemed enough proof. “Have you seen a Robo, Suzette?” Miche asked her. “But you have us,” Miche told her. He smiled at her. She smiled back. She was starting to understand how it was that The Doctor had so easily fallen in love with Dominique. For her, lately, her ideal was a blue eyed man in homespun clothes. She knew he was interested in her. He found every opportunity to sit next to her and to talk to her, to be with her in the evening, taking walks around the high walkways. But the closest they had been yet was when they danced at The Doctor’s wedding. He seemed shy of getting any closer to her. They had not yet kissed. Until one evening after The Doctor had been gone for a fortnight and she had almost started not to mind that he was gone and she was stranded on a strange planet. She and Miche stood on one of the high walkways looking down on a torchlit Bâton Haut practice in the evening of a fine, pleasant day. How far away that life was now! She had almost forgotten that her ambition was to be a journalist. She had almost begun to think it was to be a silk weaver. “Far away and in another time,” Susan answered. “Then… Then I shall ask The Doctor to take me to Earth in your time, so I can see you,” he decided. “Yes,” he said “Suzette….” She gasped as he reached and held her close and then kissed her on the lips. The pink and fluffy magazines she never read would have called it a perfect romantic moment. It WAS her first REAL kiss. “Suzette....” he began. She looked at him and waited for him to continue but they were distracted by a noise she had never expected to hear on Forêt. The romantic moment was forgotten as she began to run. Something was wrong here and The Doctor wasn’t there. She was there in his place.